Energizer activities are like hitting a refresh button for the brain and body. They not only redirect the brain to an alert and focused state in order to process new or complicated information, but also allow for a change in perspective, which can lead to generation of different ideas and solutions. Energizers benefit learners through enhanced concentration, re-activation of creativity, and improved brain and physical health. 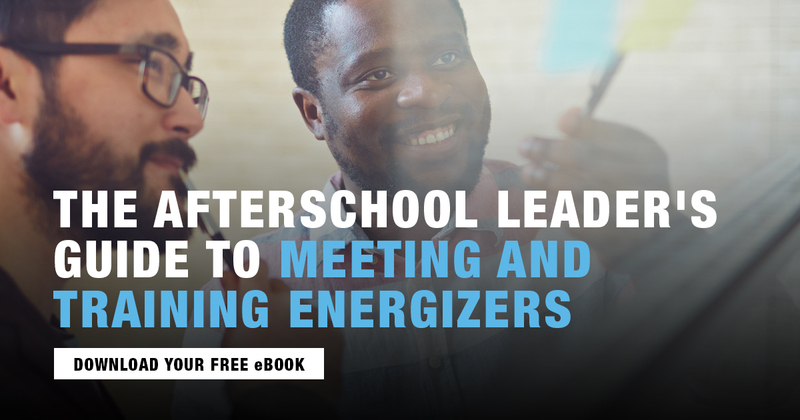 The Afterschool Leader’s Guide to Meeting and Training Energizers provides professionals with a variety of activities that can reinvigorate meeting participants. NAA is the membership association for professionals who work with children and youth in diverse school and community-based settings to provide a wide variety of extended learning opportunities and care during out-of-school hours. Learn More!